Imagine being the most wanted gunslinger in the galaxy and yet you had never killed a single being. This is the dillemma facing Vash the Stampede or the human cyclone as he is known. Vash is responsible for the destruction of entire towns but never taken a life. A price is on his head and and yet whilst the bounty for him is high, no one is truly sure of what he looks like as reports and innuendo get out of hand with some delightful results. This disc has four episodes on it, all of which are fast paced and very well animated. Vash is an awesome looking character and after the explosive opening sequence, all I could think was "cool"! The anime is done with such style that it'll blow your mind! Everything that Vash does looks cool as beans and the entire disc is a lot of fun. The show has some absolutely freaky characters which adds to the insanity of the series. When you put an insane script together with characters that are just as nutty, then Trigun makes for some compelling viewing. The animation was originally done in full frame and I do believe that it would have had far more impact if it had been done in a widescreen format. The explosive action and the way that it is depicted fully lends itself to the 16:9 format and would have made an excellent show even better. Once again, audio lets us down a little by only being in Dolby Digital 2.0. With the amount of gunplay and explosions, this would have been far better in full 5.1 using all speakers to enhance the DVD experience. The extras on this DVD are fairly standard and do not add anything to your viewing experience. 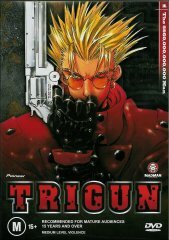 Trigun Vol. 1 was a fun viewing experience that I have no trouble recommending to anyone. It's a lot of action packed into it's 100 minutes running time that should keep viewers glued to their seats!